This mug stands 3" to the top edge, 3 1/2" to the highest point of the handle, has a top opening 2 3/4" across, a rimmed foot that is 1 7/8" in diameter, and weighs 2.9 T. oz. It has double marks, one of which is "WG&S" for William Gale & Son, and a second which is three part, one of which includes a diamond imprinted with the date "185x," with the final number obscured. Measuring 7 3/4" long and weighing 2.0 T. oz., this fork has rounded shoulders and three wide and lengthy tines, the outer two of which are splayed. The form is uncommon and hence of uncertain function. It may be a spinach or toast/bread fork, or for another purpose yet. 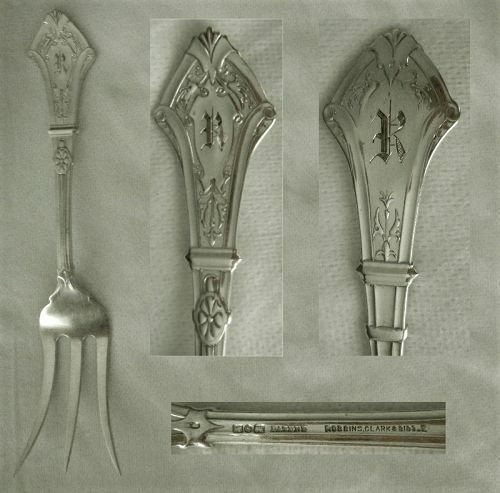 The proportions assure it is definitely original and not adapted from another piece as, for example, most potato forks are derived from dinner forks. The name Wilson is deeply entwined with the history of Philadelphia silver dating from the first half of the 19th century, and that story began with Robert Wilson Senior (1766-1824) and continued through two more generations. This item is double stamped "R.W" for the progenitor, Robert, who Catherine Hollan in Philadelphia Silversmiths notes, was "probably born in Scotland, [and] was listed as a silversmith in New York City directories 1803-10, then settled in Philadelphia in 1812." At 8 1/4" long, and relatively weighty at 1.9 T. oz., this coin silver spoon was likely a place piece in its circa 1865 period, but is today's tablespoon size. Made by Albert Coles of New York City, it bears his three part "eagle, AC, bust" mark on the reverse, along with "A. Coles," which added identifier is not frequently found. There is a feathered script "W" monogram on the handle front. Produced by John. 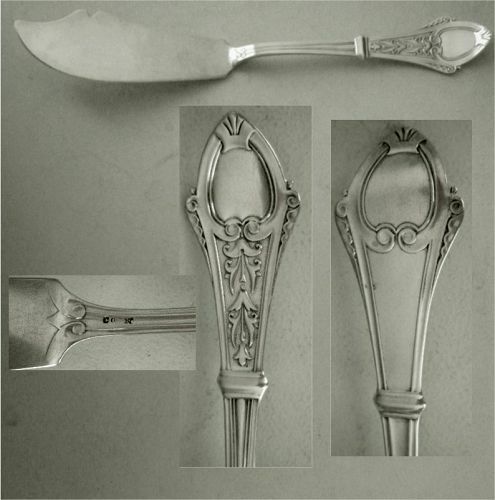 L. Westervelt of Newburgh, New York, as indicated by the "star, lion, bust" pseudo-hallmark imprinted on the backsides, and also marked for retailer "B. Marsh" of nearby Albany, these eight, matched teaspoons are in the "Floral" pattern. Each one measures 6" long, while the lot weigh 6.3 T. oz. Dating circa 1865, they are to a coin silver standard. All have a fancy script "SFW" monogram set sideways on the handle. Measuring 7 1/16" long and substantial weight at just under 1.5 T. oz., this solid coin silver master butter knife has a flat handle on a plane with the blade. Stamped "R&W. Wilson Philad" on the blade, it was made by brothers Robert and William with dates spanning the second quarter of the 19th century. A matched set, each of these candlesticks is marked on the brushed finished, flat bottom, underside, "Tiffany & Company," "Sterling," "925/1000," "m," pattern number "18929" (introduced in 1916), order number "5839," and the word "weighted." They weigh 19.9 T. oz. the pair, but that is essentially irrelevant because of the fill in them. A pattern originated by John Polhamus in the second half of the 19th century, and continued by George Shiebler, "Corinthian" is a Greek Revival design that features an anthemion at the handle end, supported by rosettes and palmettes. 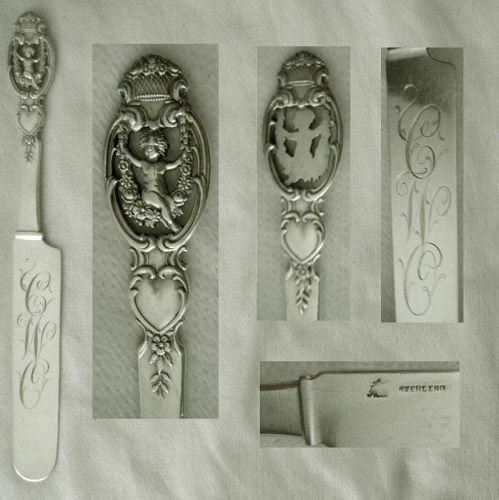 These six place or dessert spoons are all matching, were never monogrammed, measure 7" long each, and weigh 8.0 T. oz. the group. Catherine Hollan in her volume Philadelphia Silver lists 1825-49 as directory dates for the Philadelphia firm of Robert & William William, noting they were referenced in a letter dated 1821, while the firm "continued to be listed in Bywater's and Boyd's directories until 1851." 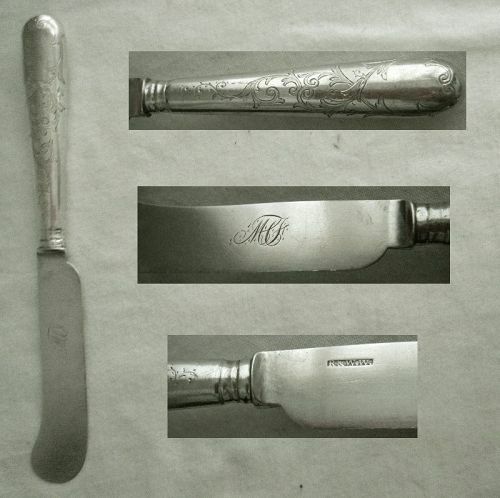 A wide variety of silver is still found with the company's various marks, the one on this 7 1/8" long master butter knife being "R&W.W." Catherine Hollan in "Philadelphia Silversmiths" lists William Faber as working by 1828 and joined by sons Charles and William as "Faber & Sons" in 1866, which name and firm lasted until 1887. A charming composition, this 6 3/4" long, .9 T. oz., youth knife incorporates a cherub-like child sitting on a floral garland swing, surrounded by an open, scrolled border that is situated above a raised heart. The handle end is surmounted by a basket of flowers. Recognized as the creative impulse who, with his son Edward, transformed Tiffany & Co. from a retailer to the major silver manufacturer that it became, New York City's John C. Moore was an established silversmith long before his association with Tiffany began. Measuring 8 3/4" long and weighing just over 2.0 T. oz., this piece is a berry scoop or shovel. 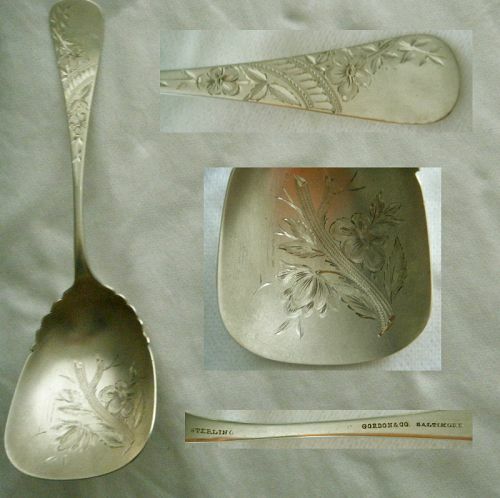 Marked "Berry & Co. Baltimore," for that city's firm with working dates 1880-94 according to Maryland Silver published by the Baltimore Museum of Art, and "Sterling," the pattern is a finely engraved flower and leaf design on the tipt back handle. This is interpreted in an Aesthetic manner, set against a satin matte finish. Price for the set of ten. 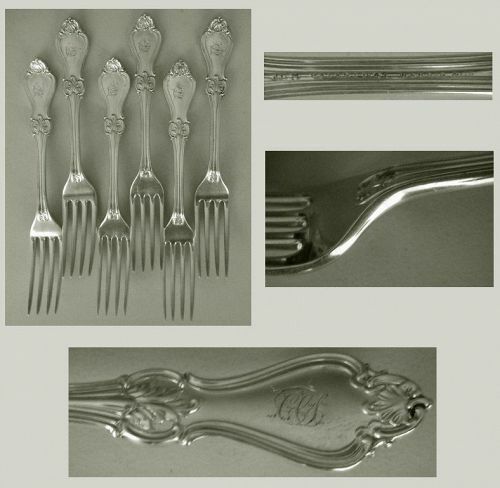 A non-line flatware pattern, meaning it was made in only a limited number of pieces, the design on these ten, 4 1/8" long, 2.9 T. oz. the group, coffee spoons (slightly larger than a true demitasse) features of series of graduated size rosettes on the front a scalloped edge handle. Aesthetic in manner, and likely dating about 1880, there are two types of blossoms, one six petaled and one multi-petaled. It is fully stamped with Paris hallmarks for first standard, i.e. .950 pure (vs. .925 for sterling), including the "bearded man" head used 1819-38, a female head large guaranty mark, and a bigorne. 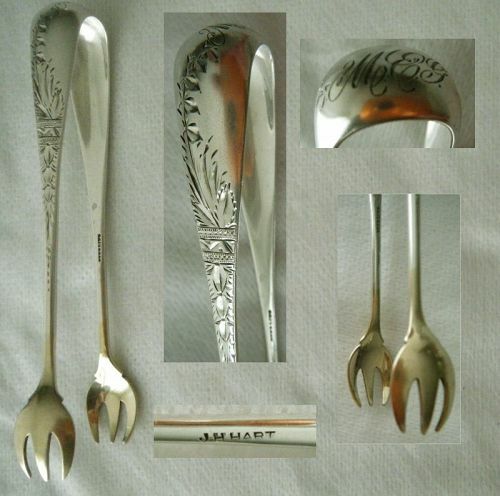 One of the pairings within the Bateman Family of silversmiths, that of Peter and Ann, brother and sister-in-law, son and daughter-in-law respectively, of Hester, dates from the last decade of the 18th century. This 8 3/4" long, approximately 2.0 T. oz., table or serving spoon, has complete and clear marks for these makers, "PB/AB," sterling, 1791, and a duty (bust) stamp. It is an "Old English" form with a downturned, tipt backside, handle. Measuring 4 1/2" long and weighing .7 T. oz., this pair of sugar tongs are marked "Sterling" and "J.H. Hart," for the Brooklyn, New York retailer with dates 1857-c. 1910.